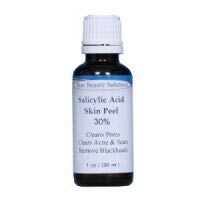 Lightens acne scars and reduces active acne Reduces Oil Smoothes Skin Post Peel Peeling can be annoying but resolves quickly Let me preface this by saying I use a 2% Salicylic Acid Gel 2x daily and have had in-office peels in the past. Wow! This product is cost effective, efficient, and truthful to it's pH properties, etc. I have really noticed a reduction in acne, acne scaring, hyper pigmentation, skin texture, sun damage, and fine lines. For frequency, I apply the peel once a week to achieve the results I desire and have done so four times already and continue to do so for another six times. After that I plan to keep this as a maintenance peel 1x per month. I also use Tazorac 0.1% creme at night leading up to and after the peel, so it will penetrate deeper and have more even peeling. To apply, I use a gentle cleanser from Cetaphil and make sure the pre peel cleanser is neither emollient or contains oils, since you are trying to strip the skin for deeper penetration. After patting my face dry, I apply 70% isopropyl alcohol on a cotton swab all over the application area (face and neck). For those with more sensitive skin (those who do should not be using this peel anyways) should apply a coat of petroleum jelly to the lips and around the eye area. Once the area has air dried, I place a few drops of the peel solution in a glass bowl and quickly dip my fan brush into the bowl and take light sweeping strokes all over my face and neck. There might be noticeable frosting, which is okay and I may apply another coat to more problematic areas. Again, since my skin is more well acclimated to the higher concentration I go ahead and leave the solution on for 10 minutes. After the timer is up, I rinse the peel off with cool water for a minute and cleanse my skin with my normal Paula's Choice Skin Balancing Cleanser and follow with product line's toner. After that I apply a pure hyaluronic acid serum with my antioxidant serum and vitamin C booster. This post peel time is extremely important for healing the skin, so make sure to use plenty of moisturizer. Also, always use a zinc oxide based sunscreen during the day rated SPF 30 or higher to protect the skin from further damage of the newly exposed and healing skin. As for benzoyl peroxide application and continuing my daily BHA exfoliation, I start them a three days after the initial peel. Things to expect after application: peeling will start 2-3 days after application and the skin may become red, inflamed, and irritated. This is normal, but be sure not to pick off large sheets of skin, which may cause additional scaring. The skin will continue to peel for the next five or so days and if peeling becomes intense I take a stem shower and gently use my fingers and warm water to manually exfoliate. As well, I carry Cerve lotion and creme with me during the day, which minimizes GREATLY the appearance of pesky flakes that are quite embarrassing (and do apply it generously). I am fair skinned, so post peel hyper pigmentation is not an issue and have a 4% hydroquinone scrip to lighten some other marks I have. In all, this is a fabulous product and I do recommend it to experienced users with caution. Thank You Skin Beauty Solutions! -helps clear blackheads, whiteheads - helps scars and acne - clears complextion -Stings alot on applications -peeling for a few days I bought this peel over ebay. Its a pretty reasonable price. I use to go to make-over salons and get these peels done for about $100.00 CDN now I do them at home myself with this product. I apply once every 2 weeks and leave on over night. My face has cleared up dramatically !